Day 3: Literacy 2.0 - Hosted by Danielle @ There's a Book. The theme of Day 3 focused on the future of literacy and the impact that technology is having on how our children learn to read and write. The excitement of new devices like Nooks and iPads along with Apps for phones have many wondering the best way utilize their capabilities to help our children become life long readers. Chris Singer @BookDads talked about his purchase of the Nook Color and his experiences with his daughter. Holly Latkin @ LitLad shared her App suggestions for iPod Touch and iPad. I will be checking out many of these this week! Paul Hankins @ Mr. Hankins shared his experiences using Skype to bring readers and authors together through an interactive platform in his classroom. This was a great post. I have been noticing more and more that children's authors are offering "Skype Chats" as a service. Very exciting for teachers and students! When I read Paul's post it made me wish I was back teaching! What is your favorite "way" to share literacy with kids? I love nothing more than to read a book aloud to a group of students at school or to my children at home. Last September, I filled in for my wife as her substitute teacher while she was on maternity leave with our third child. As an intervention specialist, I didn't have my own classroom, but spent time in many classrooms. I always carried books around with me hoping a classroom teacher would notice the book and ask me to read. There was one teacher that was very receptive to me reading to her class. Over the course of the month, the students and I created a special bond through the books I read. I loved hearing them ask their teacher, "Can Mr. V read us a book?" The teacher would often say, "Mr. V has some work to do, but maybe he can come back after lunch." It was such special treat for me to read to them after lunch and ease them back into their afternoon activities. Last week for Dr. Seuss's birthday I was invited to read to my son's preschool class. I read The Foot Book and What Was I Scared Of? 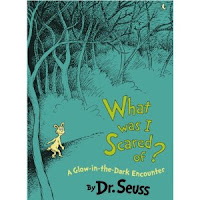 which were books that my son selected as his favorite Dr. Seuss books. It was very special to read to the class that day, but it was what happened two days later that I will always remember. One of my son's friends asked me, "Can you read me that scary pants book again?" Unfortunately, I didn't have the book with me, but I told him I would bring it in tomorrow. Well, that was today. I started by reading the book with my son and his two buddies and it wasn't long before half the class was huddled around the bean bag chair listening to the story. "Can you read a book to me?" is a question I never want to answer with "No." This can be difficult with the busy schedules that accompany even my young children and the timing of kids is not always best. However, I have found that even if it is not a good time to read the book, I can always offer a specific time that I will read the book to fulfill the request (the hardest part is remembering!). Reading aloud to children is something I love to do, but my favorite "way" to share literacy is having a child ask me to read them a book and finding a special time to share it together. Yeah! This is a great story ... and works perfectly with today's theme, too! The thing I like the best about bedtime with my kids is laying on a bean bag chair with one child on each side and reading stories upon stories to them.